Did you know that Columbus is home to one of the largest populations of Somalis in the world? Our Somali community is third in size only to Somalia itself and the Minneapolis-St. Paul area. The Somali community in Columbus and across the U.S. grew in the early 1990s, and because of our booming population, central Ohio residents enjoy many options to experience authentic Somali cuisine. Here are a few highlights to help you get to know Somali food and culture. Hoyo’s Kitchen is an excellent starting point for exploring Somali fare. “Hoyo” is Somali for “mom,” so whatever your upbringing you’ll see parallels to the hearty comfort food of your mother’s home-cooking. The fast casual eatery is easily accessible to both regulars and newcomers to Somali cuisine. Start with their sambusas (triangle-shaped pastries filled with meat and vegetables) and bijaya (mashed beans that are fried crispy), then move on to combo plates that let you mix and match dishes. 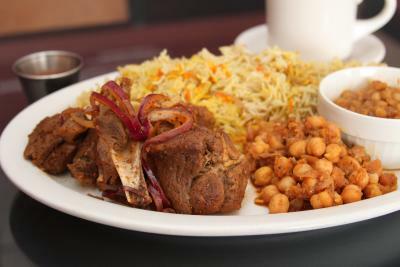 Don’t leave without trying the goat – it’s amazingly tender and well seasoned. Calanaley Restaurant on Cleveland Avenue is a small structure without windows, but inside you’ll find exceptional meals like beef stew and roasted chicken with rice and pasta, supplemented by fruit juices and the standard banana that’s served with Somali meals. Banadir Cuisine Restaurant is a good spot for soup and fried fish. 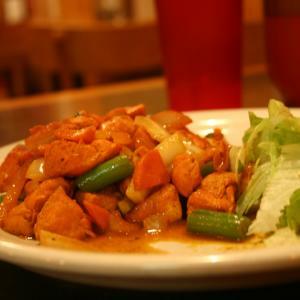 The restaurant features a common item on Somali menus called suqaar, which features a protein like chicken or beef diced and served in a light gravy. 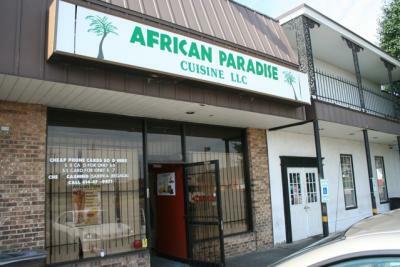 African Paradise is a warm and welcoming spot to experience Somali cuisine. The servers are more than willing to explain the menu and help you choose items. Start with a selection of flatbreads and tea, then order a platter featuring goat, chicken, and fish. The dishes are served with rice and a spongy sour bread called anjera or canjero, with which you scoop of bites of food. 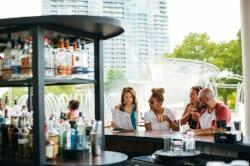 Close by, Ginevra Cafe offers platters and sandwiches. Start with simple dishes like lamb, beef, or chicken paired with rice, and be sure to sip the sweet tea. More options for exploring Somali cuisine abound! Ethiopia and Somali Restaurant on Cleveland Avenue serves the closely-related cuisines from both countries in their name. Durbo’s Somali Restaurant in North Linden is a cozy spot serving generous portions of everything from goat curries to grilled fish, while Hamdi Grill offers tasty chicken suqaar, fish, and goat.